Aries: If you want to have an amazing shopping, you should take Aries friend. They are the best choice if you are planning a long shopping day, full of packages and good emotions. You will go through all the shops, and try many clothing, because Aries is energetic and funny person to go with. They are generous for a good advice, you may be sure that you won't be misguided. Aries are always in trend, they know the freshest fashion tips and can be a great company during shopping. However, they are quite extravagant, so under their influence you can buy amazing dress, but think twice whether you would wear it or not. Taurus: Taurus people are very independent and have a set of preferences in clothing. They don't really care if someone else thinks them to be a little bit strange, they fully accept themselves. They sort of like to stand out of the crowd. They have a style, and don't fall for fashion. They like interesting and extraordinary color choice, and they have their perception of beautiful. They like different prints, mixes, ornaments and have a "smell" for good clothing. Taurus always knows when and where sales and discounts are. As for men representatives of Taurus, they don't like shopping at all, while females are often impatiently waiting for a sale season. Gemini: Gemini are people who love to tell about their achievements and demonstrate their status and possessions. They will want you to go shopping with them, taking your time and efforts. They will decide which place is the best one to go shopping, and they will really choose the best place, you shouldn't even doubt it. You are going to have so many things bought with Gemini! It will be a shopping of all times. You may be quite uncomfortable with such people in boutiques, but if you are heading to a flea market and other market with interesting finding take Gemini with you, as they have a sixth sense for a good cloth or thing. Men Gemini are neutral to shopping, they will just help you with advice and hold your bags if you ask them. Cancer: Men representatives of Cancer sign are brilliant shopping companions. They are patient and will give advices only for the sake of your good look. They are quite generous, no matter you are friends or family. They don't really like giving advices, as they try not to intervene into the private life of others. As for women Cancers, they are calm shoppers and they like to give advices if they are asked. 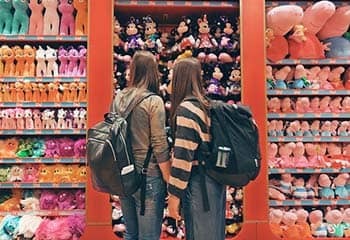 If they want to buy something, they rarely bring friends with them, so if they go shopping with you - it is a sign of good friendship and fun time spending. Leo: They would rarely go shopping with you. But if they do, it will be very long and time consuming. They tend to hesitate about everything they fit in, because they need a perfect clothing to emphasize their best parts. However, they have a good taste and sense of style. Everyone has something to learn from their style preferences. It is quite interesting and fun to shop with them, but don't expect them to search for your clothing. Take a lion with you when you go to an elegant and sophisticated place, because such people don't like mass market shops. Such places make them feel usual and that hurts their ego. When they go shopping, they usually do it or alone or with someone who approves their attitude to it. Virgo: Virgo would love to go shopping with you. They are fans of shopping, as it is associated with good time spending for them. They are very curious and will go to any shopping place to find out the assortment, sales and special offers. However, it has a flipside. They may go bananas looking for a better offer, comparing prices and quality. It is not bad, but it takes too many efforts and leaves everyone exhausted. They will let you buy something only when they are sure it is the best option. So if you are not a fan of excessive analyzing of the market, better go alone. You can just get confused by all the demands they have. Still, it doesn't mean that you should buy something that catches your eye first, proper consultation is always needed. Going shopping? Choose the right zodiac to ensure with a wonderful experience. Scorpios are good companions during the shopping time, especially Scorpion husbands, as they will always prevent you from a wrong deal. Pisces are quite emotional during shopping.